This protocol provides a simple and efficient way to propagate human pluripotent stem cells (hPSCs) using only conditioned media derived from the human placenta in a gelatin-coated dish without additional exogenous supplementation or hPSC-specific synthetic substrata. Jung, J. H., Kim, B. S. A Novel Culture Model for Human Pluripotent Stem Cell Propagation on Gelatin in Placenta-conditioned Media. J. Vis. Exp. (102), e53204, doi:10.3791/53204 (2015). The propagation of human pluripotent stem cells (hPSCs) in conditioned medium derived from human cells in feeder-free culture conditions has been of interest. Nevertheless, an ideal humanized ex vivo feeder-free propagation method for hPSCs has not been developed; currently, additional exogenous substrates including basic fibroblast growth factor (bFGF), a master hPSC-sustaining factor, is added to all of culture media and synthetic substrata such as Matrigel or laminin are used in all feeder-free cultures. Recently, our group developed a simple and efficient protocol for the propagation of hPSCs using only conditioned media derived from the human placenta on a gelatin-coated dish without additional exogenous supplementation or synthetic substrata specific to hPSCs. This protocol has not been reported previously and might enable researchers to propagate hPSCs efficiently in humanized culture conditions. Additionally, this model obviates hPSC contamination risks by animal products such as viruses or unknown proteins. Furthermore, this system facilitates easy mass production of hPSCs using the gelatin coating, which is simple to handle, dramatically decreases the overall costs of ex vivo hPSC maintenance. The goal of this protocol is the propagation of human pluripotent stem cells (hPSCs) including human embryonic stem cells (hESCs) and human induced pluripotent stem cells (iPSCs) in fully humanized ex vivo feeder-free conditions without requiring additional exogenous supplementation and synthetic substrates. To date, the development of ex vivo hPSC culture models, that enable the introduction of culture products to the clinic, has been a major concern in stem cell research. Specifically, two critical problems need to be addressed. First, a humanized ex vivo culture system for the propagation of hPSCs that obviates the risk of contamination by animal cell products is needed. Second, a feeder-free culture model is needed to facilitate easy and economic mass production of hPSCs. For therapeutic applications of hPSCs, it is necessary to identify the factors that regulate their self-renewal and differentiation. Since Xu et al. initially reported the feasibility of using conditioned media (CM) derived from mouse embryonic fibroblasts (MEF) to grow hESCs on Matrigel1, many studies have examined optimal ex vivo propagation methods for hPSCs2-4. However, an ideal humanized ex vivo feeder-free hPSC propagation system has not been developed because current methods require additional exogenous substrates including bFGF and insulin, well-known hPSC-sustaining factors, in culture media5-7. Moreover, synthetic substrata such as Matrigel or laminin are used in all feeder-free cultures. The rationale behind the development and use of this protocol is based on our previous studies showing that human placenta chorion cells excellently support the propagation of hPSCs without bFGF supplementation8-11. This protocol has a number of advantages including its simplicity with respect to handling and its cost-effectiveness, and it is a near-perfect humanized culture that enables hPSC propagation without exogenous synthetic substrates. The application of human placenta-derived CM (hPCCM) for hPSCs involves 3 steps. First, chorion cells are isolated from the human placenta and cultured. Second, hPCCM is produced from cultured cells. Third, hPSCs are cultured using hPCCM and their characteristics are confirmed. This protocol will facilitate clinical applications of hPSCs and studies of the mechanisms of hPSC proliferation and attachment. In this paper, the protocol for the successful propagation of hPSCs in hPCCM on a gelatin-coated dish is presented. Ethics statement: The human placenta study was conducted prospectively, with the approval of the Institutional Review Board for human research of the Korea University (AN09085-001). All experiments were performed in a Clean Germ-Free Room facility at the Korea University Medical Center. 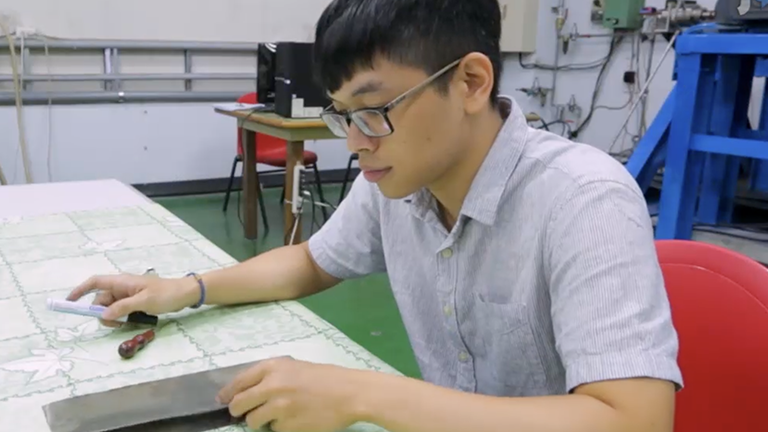 The experimental design and procedures using hPSCs were approved by the Institutional Review Board of the Korea University Medical Center (AN12277-003). Coat all the culture dishes with 0.1% gelatin. Autoclave phosphate-buffered saline (PBS) and forceps. Sterilize surgical scissors, microcentrifuge tubes, and gauze at 121 °C under 15lb psi for more than 15 min. Prepared pre-warmed 0.25% trypsin-ethylene amine tetra-acetic acid (trypsin-EDTA) and pre-warmed filtered culture media (DMEM) containing 20% fetal bovine serum (FBS), 100 U/ml penicillin, and 100 g/ml streptomycin before commencing procedures. Obtain placental tissue, after caesarean section delivery, from healthy pregnant women undergoing normal or therapeutic abortion at 7–32 weeks of gestation after obtaining written informed consent. Have the obstetric specialist surgically separate human placenta chorionic plates (HPCs) from the placenta; incubate these in 0.25% trypsin-EDTA at 37 °C for 20 min, and then wash with 5 ml PBS. Isolate chorionic villi from HPCs using scissors; mince the villi and wash them three times with 1ml PBS. After mincing, place the chorionic villi into a microfuge tube using a pipette tip; wash the samples with 500 µl PBS by pipetting up and down, and centrifuge the tubes for 120 x g for 3 min. Wash tissues twice with 500 µl of pre-warmed culture medium. Culture cells in medium on gelatin-coated plates at 37 °C, in 5% CO2, and under 95% humidity. Pre-coat all plates with 0.1% gelatin for 1 hr at 37 °C. Colonies of fibroblast-like cells will form and adherent growth approximately 5–7 days after commencing culture in the same medium. Exchange the medium every 2–3 days until the third passage. During culture, removing cell debris floating in the culture medium; growing placental fibroblasts will attach to the plate. Culture the fibroblast-like cells derived from the HPC up to the 10th passage and then harvest them for hESC cultures after trypsinization and mitomycin-C (10 µg/ml) treatment. Before freezing HPCs as stock samples, use reverse transcription–polymerase chain reaction (RT-PCR) to confirm that HPCs are not contaminated with pathogens that commonly infect the placenta, including mycoplasma (M. fermentans, M. hyorhinis, M. Arginine, M. orale, M. salivarium, M. hominis, M. pulmonis, M. arthritidis, M. neurolyticum, M. hyopneumoniae, and M. capricolum) and the bacterial species, Ureaplasmaurealyticum, by using a mycoplasma detection kit. Follow the manufacturer’s instructions to perform RT-PCR, use all primers and mixtures provided in the kit. Use the supernatants of the cells that have been cultivated for 36 days for mycoplasma detection. Add 3 µl of these samples to the PCR mixtures and perform the 1st PCR procedure for 35 cycles, each consisting of 94 °C for 30 sec, 55 °C for 2 min, and 72 °C for 1 min. Carefully add 0.5 µl of the 1st PCR product to the PCR mixture and perform the 2nd PCR procedure for 30 cycles using the same conditions as before. Analyze the amplified products by 1% agarose gel electrophoresis; apply 10 µl of each of the 1st and 2nd PCR products to the gels. If HPCs are found to be contaminated with pathogens, eliminate these using a combination of antibiotics (BM-Cyclin), following the manufacturer's instructions. Add new medium containing 10 µg/ml of BM-Cyclin 1 for 3 days, and then treat the cells with 5 µg/ml BM-Cyclin 2 for another 4 days. Repeat this cycle twice and then check for mycoplasma contamination again. After excluding contamination, treat the attached cells (85-90% confluence; (1.5 × 107 cells/flask) with mitomycin-C (10 µg/ml) for 2 hr and 30 min, and washed the cells three times with 10 ml PBS. Incubate the cells with pre-warmed medium without mitomycin-C for 24 hr. One day after treatment, incubate cells in 10 ml medium (DMEM-F12 supplemented with 20% Knock-Out Serum Replacement [KOSR], 0.1 mM β-mercaptoethanol, 1% NEAA, and 1% penicillin–streptomycin). After 24 hr of incubation, harvest CM in a 15-ml conical tube and filter the CM using a 0.22 µm syringe filter. Add another 10 ml of new medium and incubation. Collect all supernatants from the cultures every day for 1 week and freeze the harvested medium at –80 °C. Avoid repeated freeze-thaw cycles. Obtain Human embryonic stem cell lines, H1 and H9 cells (listed in the NIH hESC registry under the name WA01 and WA09, respectively) and induced-pluripotent stem cell iPSC-1: iPS(foreskin)-1 and iPSC-2 (IISH1i-BM) from the WiCell Research Institute (Madison, WI, USA). Cells should be thawed and cultured following the manufacturer’s instructions. For the control group, culture cells on Basement Membrane Matrix-coated dishes in widely used feeder-free and serum-free defined culture medium at 37 °C and in 5% CO2. Initially, seed 80-100 clumps of hPSCs in 35-mm dishes. Grow cells in these dishes until 70-80% confluence and routinely passage cells for sub-culturing once every 5–6 days, using mechanical or enzymatic methods (Dispase). Wash cells twice with medium and plate them at a ratio of 1:4. Replace the medium with fresh medium every day. 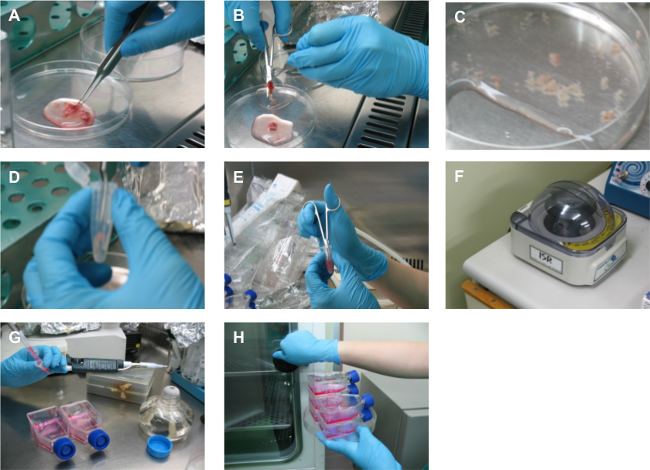 For the experimental groups, culture cells in hPCCM on dishes pre-coated with 0.1% gelatin and perform routine passaging once every 5 days, either mechanically or enzymatically. Plate cells at ratios in the range of 1:6–1:10. hPSCs attach to the gelatin within 2 days after transfer. Replace the medium with fresh medium daily. NOTE: Characterize hPSCs using several methods, such as alkaline phosphatase staining, immunocytochemistry, Quantitative real-time PCR (qRT-PCR), and western blotting. For immunofluorescence staining, culture hPSCs and fix the cells in 8-well slide chambers with 4% (w/v) paraformaldehyde for 10 min; then, permeabilized the cells with 0.1% (v/v) Triton-X100 for 15 min, and block the cells for 1 hr with 3% (v/v) normal horse serum in PBS containing 0.1% (v/v) Tween-20. Wash PBS twice for 5 min between every step. Incubate cells with the primary antibody (OCT-4, SSEA4, TRA-1-81, TRA-1-60, dilution of 1:1,000) O/N at 4 °C and with the secondary antibody. Before mounting, incubate cells with 4′,6-diamidino-2-phenylindole (DAPI) for 5 min in the dark. Wash cells stringently three times for 5 min each and dry cells completely, in the dark. Preserve cells in fluorescence mounting medium and observe them under a fluorescence microscope. Isolate total RNA from cells using an RNeasy mini kit according to manufacturer's specifications and quantify the extracted RNA using a Nano Drop Spectrophotometer. Synthesize cDNA by adding 2 µg of the total RNA to a 20-µl reaction mixture containing oligo(dT) primers and Superscript II reverse transcriptase; follow the manufacturer’s instructions in this procedure. Amplify the synthesized cDNA with a Bio-Rad iCycler iQ system, using iQ SYBR Green qPCR Master Mix and the primer sequences described in Supplemental Table S1. Normalize the cycle threshold values of the genes of interest to those of glyceraldehyde-3-phosphate dehydrogenase (GAPDH). Detect AP activity using the ES Cell Characterization Kit, according to the manufacturer’s protocol. On day 5, aspirate the media and fix the hPSCs with 4% paraformaldehyde in PBS for 12 min. Do not overfix; fixing cells for longer than 2 min will result in the inactivation of alkaline phosphatase. Aspirate the fixative and rinse with 1x Rinse Buffer. Do not allow wells to dry between steps. Add enough staining solution to cover each well (1 ml per well of a 35 mm dish). Incubate plates in the dark at RT for 15 min. After incubation, wash dishes with 1x Rinse Buffer. Cover cells with 1x PBS to prevent drying and examine and image the stained cells using an Olympus microscope. Perform western blot analysis as previously described in9. Briefly, determine protein concentrations in cell lysates. Resolve equal amounts of protein on a sodium dodecyl sulfate-polyacrylamide gel electrophoresis (SDS-PAGE) gel and transfer the proteins onto a polyvinylidene fluoride (PVDF) membrane. Block the blot and probe it O/N with different primary antibodies at 4 °C; subsequently incubate the blot with HRP-conjugated secondary antibodies for 1 hr. Wash the membrane three times for 10 min each time between incubations. Detect signals using an ECL reagent. hPSCs were harvested from the control and experimental groups at the same passage. Genomic DNA was extracted using a DNA Micro kit, according to the manufacturer’s instructions. Amplify the genomic DNA for 16 different genetic loci using the AmpF/STR PCR Amplification Kit, according to the manufacturer’s specifications and capillary electrophoresis was performed using a Genetic Analyzer. One advantage of this hPSC propagation method is that it uses components secreted from human cells. A most ciritical step in the protocol is the isolation and culture of human placenta-derived cells. This requires and accurate dissection from a precise part of HPC plate villi. Figure 1 shows the procedure for human placenta-derived cell isolation. This process is simple and convenient for the isolation of cells, and can easily be performed within 1 hr. As described in Figure 2, tissues attached to the gelatin-coated dish and fibroblast-like cells sprouted robustly. Removal of debris and decayed tissues during passages by trypsinization allows the selection of cells and ensures a homogeneous culture. These cells can be used to produce conditioned medium for hPSC proliferation of after confirming a lack of contamination. Optimal conditions were defined as, those that allowed cells to grow to 80–85% confluence, after which the growth was artificially stopped (data not shown). hPSCs cultured on feeder cells or synthetic matrices can be transferred to gelatin-coated dishes in hPCCM. Figure 3 shows that hPSC lines can be maintained in hPCCM at a level similar to that observed for Matrigel-coated plates (Figure 3A and B). 0.1% gelatin has not been uesd for hPSC culture until now. In our conditions, hPSCs expanded and maintained pluripotency, similar to hPSCs in the control group. To confirm that the hPCCM accessed other matrices for the hPSC culture, hPSCs were sub-cultured on laminin, vitronectin and non-coated dishes. hPSC attached and grew in hPCCM on laminin- and vitronectin-coated dishes. However, after several passages, many colonies were differentiated and did not maintain, unlike those on the gelatin-coated group. After transfer to the non-coated dishes, no attachment was observed for hPSCs (Figure 3C). To confirm that hPSCs were genetically identical to the control group after long-term culture in hPCCM, hPSCs cultured in parallel from both groups were analyzed using a short tandem repeat (STR) technique for 16 genomic loci (Figure 3D and E). A widely accepted notion regarding the ex vivo culture of hPSCs is that bFGF is needed to promote self-renewal. In the absence of bFGF, hPSCs lose their self-renewal ability and differentiate12,13. 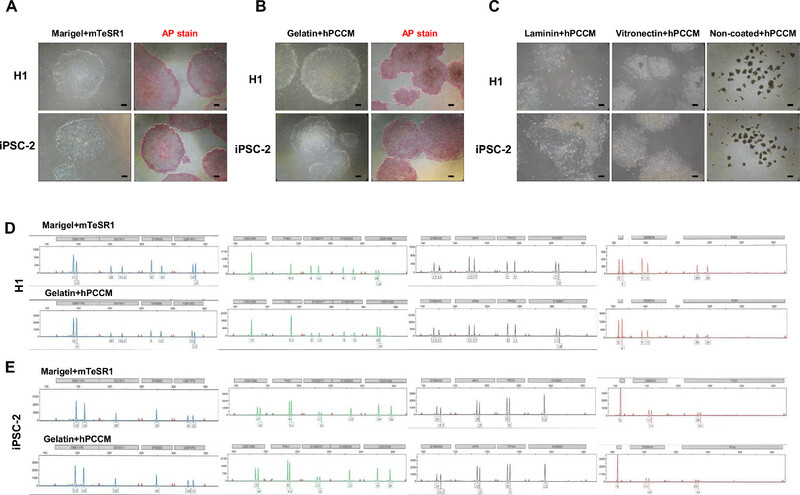 In the hPCCM condition, hPSCs did not lose their self-renewal ability and stably expressed pluripotency markers during long-term culture (Figure 4A-C). The ability to differentiation into the cells of 3 germ layers is a unique intrinsic characteristic of hPSCs. Every hPSC should be tested to verify the preservation of this ability. As shown in Figure 5, hPSCs spontaneously differentiated into cells of the 3 germ layers after 2 weeks of induction in hPCCM (Figure 5A and B). These data indicate that hPCCM is optimal for clinical usage. The attachment time on gelatin-coated dishes during hPSC transfer is longer than it is on dishes coated with commercially synthetic matrices for hPSC propagation. Usually, cells attached within a day after coating with synthetic substrates. Figure 6 shows attachment on 0.1% gelatin and on the control plates. After 24 hr sub-cultured hPSCs attached slightly more on gelatin than on the control (Figure 6A). hPSCs should be handled with caution. After 48 hr, hPSCs were completely attached and began expansion on gelatin-coated dishes (Figure 6B). Furthermore, hPSCs appeared to grow effectively and formed packed colonies on day 5 after sub-culture on gelatin (Figure 6C). During the attachment period for hPSCs, careful treatment is important and can influence survival and self-renewal. In hPCCM conditions, a 48 hr period is strongly recommended for attachment of hPSCs. Figure 1: Cell isolation from human placenta chorionic villi. (A) Fresh placental chorionic tissue was washed in PBS after trypsinization. (B) The villi were cut into pieces using sterilized surgical scissors. (C) Villi were washed several times in PBS to remove debris and vessels. (D-E) Villi were transferred to a micro-centrifuge tube, minced (maximum) and washed. (F) Tissues were centrifuged using a tabletop centrifuge. (G) This process was repeated three times in PBS and two times in pre-warmed culture medium. (H) Cells and tissues were seeded together on a pre-coated gelatin flask and incubated for 5–7 days. The cells attached and sprouted. Figure 2: Cultivation of human placenta-derived cells. (A) Approximately 1 week after the isolation, human placenta tissues and cells attached to gelatin-coated flasks and fibroblast-like cells sprouted. (B) After the first subculture passage, tissues were removed. The medium was replaced by fresh medium every other day. (C) After the third passage, cells appeared more homogeneous. Scale bars: 200 µm. Please click here to view a larger version of this figure. Figure 3: Human pluripotent stem cells in hPCCM on gelatin-coated dishes. After 13 passages, hPSCs, cultured in hPCCM on gelatin-coated dishes, exhibited high alkaline phosphatase (AP) activity. (A) H1 and iPSCs were cultured in control conditions (mTeSR1 on Matrigel-coated dishes). (B) H1 and iPSCs were cultured in hPCCM on gelatin-coated dishes. Left panel: bright field; Right panel: alkaline phosphatase staining. (C) H1 and iPSC were transfered and cultured on several matrix-coated dishes for comparison. As shown, after 5 passages hPSCs were cultured. Laminin-coated dishes, vitronectin-coated dishes, non-coated dishes. (D-E) STR analysis for hPSCs cultured in hPCCM compared with control hPSCs. Scale bars: 10 µm. Please click here to view a larger version of this figure. Figure 4: Human pluripotent stem cell propagation does not require bFGF. (A) H1 cell immunofluorescence staining with antibodies against SSEA-4, OCT-4, SOX2, NANOG, TRA-1-60, and TRA-1-81 after 14 passages on gelatin-coated dishes in hPCCM. Scale bar: 10 µm. (B) RT-PCR analysis was used to measure the expression of the stemness markers, OCT4, NANOG, and Rex1 in the different cell lines in experimental and control conditions. (C) The protein expression levels of pluripotency markers, OCT4, SOX2, and FGF2, in hPSCs were determined by western blots. Please click here to view a larger version of this figure. Figure 5: Analysis of pluripotency in vitro. (A) qRT-PCR analysis was used to measure the expression of the stemness markers, OCT4 and NANOG and the expression of three-germ layer markers in differentiated cells and undifferentiated cells grown in hPCCM conditions. As shown in the graph, measurements were normalized to the expression levels observed in the control culture conditions (OCT4). T, HNF3β: mesoderm, NESTIN, SOX1: ectoderm, AFP, GATA3: endoderm. The error bars indicate means ± SD. (B) H1 and iPSC lines that were cultured for 10 passages under experimental conditions formed embryoid bodies after 2 weeks that contained mesoderm (desmin), ectoderm (TUJ1), and endoderm (AFP, GATA4), as measured by immunofluorescence staining. Scale bars: 100 µm, 200 µm. Please click here to view a larger version of this figure. Figure 6: Comparison of hPSC attachment between two matrix-coated plates. H1 and iPSC-1 were transferred to different conditions, 0.1% gelatin in hPCCM and control group. (A) 1 day after hPSC sub-culture. (B) 2 days after hPSC sub-culture. (C) 5 days after hPSC sub-culture. Scale bars: 10 µm. Please click here to view a larger version of this figure. This model was developed to successfully propagate hPSCs, while maintaining their characteristics, in humanized feeder-free culture conditions without the addition of exogenous recombinant growth factors such as bFGF or insulin, enabling the manipulation of hPSCs in a humanized microenvironment. Exogenous bFGF supplementation is common and the application of substrata such as Matrigel or laminin is essential for feeder-free culturing of hPSCs14. This protocol is simple and easy to implement. However, some steps are critical to its success. The most important step is the aseptic isolation of chorion cells from the placenta. Owing to the collection methods for the placenta, the contamination risk of pathogens such as mycoplasma is high. Therefore, pathogen examination and management during the isolation of cells are very important. Additionally, all of the procedures must be performed aseptically. The collection of conditioned media from the culture of human placenta cells is generally easy. However, experience in hPSC cultures is needed because their handling is somewhat difficult. As an another important point, the researcher using this protocol must keep in mind that the fact that the time needed for the attachment of hPSCs in this protocol is longer (36-48 hr) than popular culture methods (approximately 24 hr). This difference does not affect the viability or proliferation of hPSCs. On the contrary, the growth of hPSCs cultured according to this protocol is more robust than that of cells cultured using conventional protocols. Furthermore, this protocol has applications for the induction of lineage differentiation. For example, human embryonic germ-like cells or progenitor cells can be turned into useful cells or tissues by the application or modification of this protocol. It provides a more accessible platform to identify specific exogenous supplements in diverse conditions. One limitation of this protocol is the dependence of hPCCM production on placenta acquisition. Therefore, a continuous human placenta supply is needed. 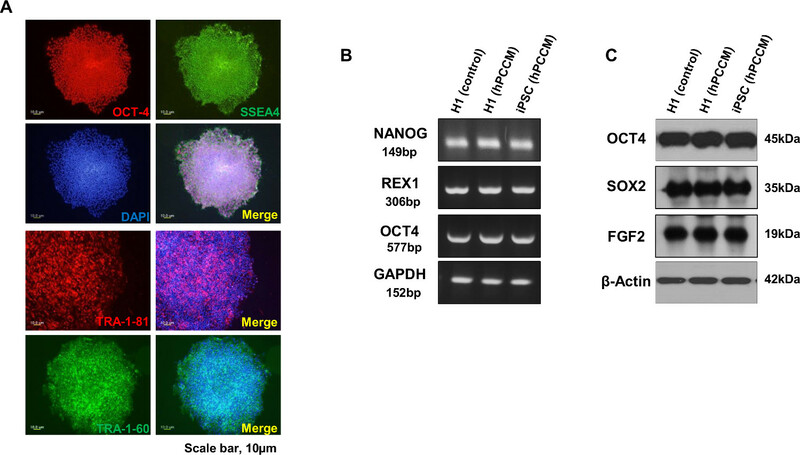 This protocol is significant because it provides an ex vivo feeder-free humanized environment for hPSC propagation without additional exogenous synthetic substrates. Future directions after mastering this technique might be applied to animal and clinical studies of products derived from hPSCs cultured in hPCCM, and to determine the mechanisms affecting the proliferation and attachment of hPSCs. This is the first detailed protocol for the successful propagation of hPSCs in hPCCM. Notably, this protocol might open new horizons in stem cell research and further studies regarding its applications and associated findings are warranted. The authors indicate no conflicts of interest. The authors would like to thank Soon-Cheol Hong (M.D., Ph.D., Associate Professor, Department of Obstetrics and Gynecology, Medical College Korea University) for providing placental tissue. This work was supported in part by grants (R1211902) from the National Research Foundation of Korea (NRF), Republic of Korea. Applied Biosystems® 3130xl Genetic Analyzer Applied Biosystems Inc.
Xu, C., et al. 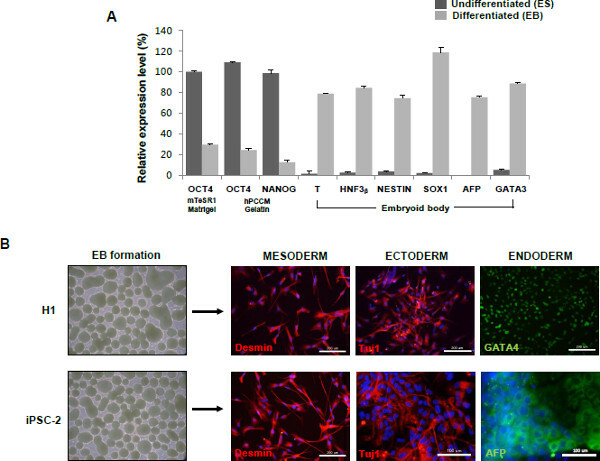 Feeder-free growth of undifferentiated human embryonic stem cells. Nat Biotechnol. 19, (10), 971-974 (2001). Amit, M. C., Shakiri, V., Margulets, J. Itskovitz-Eldor Feeder layer and serum-free culture of human embryonic stem cells. Biol Reprod. 70, (3), 837-845 (2004). Nagaoka, M., Si-Tayeb, K., Akaike, T., Duncan, S. A. Culture of human pluripotent stem cells using completely defined conditions on a recombinant E-cadherin substratum. BMC Dev Biol. 10, 60 (2010). Jin, S., Yao, H., Weber, J. L., Melkoumian, Z. K., Ye, K. A synthetic, xeno-free peptide surface for expansion and directed differentiation of human induced pluripotent stem cells. PLoS One. 7, (11), e50880 (2012). Xu, R. H., et al. Basic FGF and suppression of BMP signaling sustain undifferentiated proliferation of human ES cells. Nat Methods. 2, (3), 185-190 (2005). Xu, C., et al. Basic fibroblast growth factor supports undifferentiated human embryonic stem cell growth without conditioned medium. Stem Cells. 23, (3), 315-323 (2005). Levenstein, M. E., et al. Basic fibroblast growth factor support of human embryonic stem cell self-renewal. Stem Cells. 24, (3), 568-574 (2006). Park, Y., et al. Human feeder cells can support the undifferentiated growth of human and mouse embryonic stem cells using their own basic fibroblast growth factors. Stem Cells Dev. 20, (11), 1901-1910 (2011). Park, Y., et al. The efficacy of human placenta as a source of the universal feeder in human and mouse pluripotent stem cell culture. Cell Reprogram. 12, (3), 315-328 (2010). Park, Y., et al. Undifferentiated propagation of the human embryonic stem cell lines, H1 and HSF6, on human placenta-derived feeder cells without basic fibroblast growth factor supplementation. Stem Cells Dev. 19, (11), 1713-1722 (2010). Seok, K., et al. Human placenta-derived feeders support prolonged undifferentiated propagation of a human embryonic stem cell line, SNUhES3: comparison with human bone marrow-derived feeders. Stem Cells Dev. 16, (3), 421-428 (2007). Xu, R. H., Peck, R. M., Li, D. S., Feng, X., Ludwig, T., Thomson, J. A., et al. Basic FGF and suppression of BMP signaling sustain undifferentiated proliferation of human ES cells. Nat Methods. 2, (3), 185-190 (2005). Mahmood, A., Harkness, L., Schrøder, H. D., Abdallah, B. M., Kassem, M. Enhanced differentiation of stem cells mesenchymal progenitors by inhibition of TGF-beta/activin/nodal using SB-431542. J Bone Miner Res. 25, (6), 1216-1233 (2010).